When most people hear the word “mosaics,” they think of ceramic and glass shards pieced together to construct a larger work of art. Note that I said “shards” of glass and ceramic. I recently came across an artist whose work turns this mosaic concept on its head. 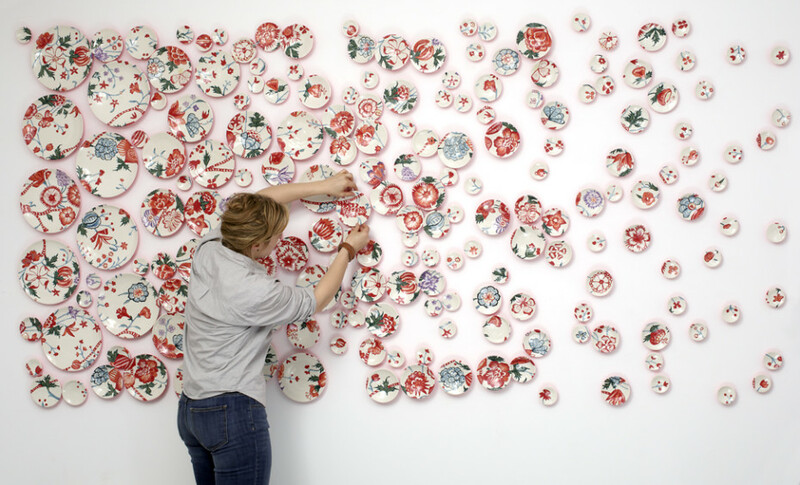 Massachusetts artist Molly Hatch creates sprawling, loosely tiled mosaics using handmade painted saucers and dishes. Hatch doesn’t need to break up her medium, in fact this is exactly what makes her work so fascinating. Each project is unique in that sometimes all saucers are of the same size, creating a grid. Other times, the saucers are a variety of sizes, creating a speckled, dissipating effect. What I enjoy most is the space between the saucers. It lets the viewer’s imagination take hold of the experience, filling in the blanks to create the full image.